Star Wars Episode Nine is coming in December. 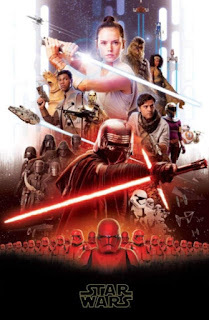 It will conclude the mainstream movies (for now) and since Disney has halted all anthology movies for the time being, its a little unclear what the future holds. Although we do know that some new series' will appear on the Disney+ streaming app. On this working poster, we see many familiar faces. 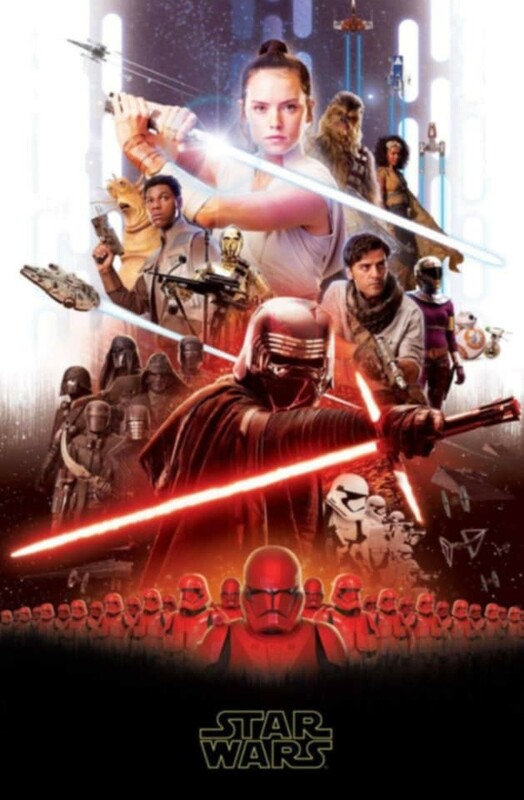 Rey, Poe, Kylo Ren, Poe, C-3PO and Chewie are all represented. The stormtroopers of the First Order are present. The Millennium Falcon is present. We get a good look at the Knights of Ren, who were Kylo Rens followers after he massacred Luke Skywalker's new Jedi Order. I wonder if they'll play a major role in this movie, I would love to learn more about them. Next to Poe I think is the character Keri Russell is going to play. The unknown character on Chewie's left is named Jannah, and the rumor is that she's Lando's daughter. If you enlarge the photo above, it gives you some costume ideas and promos for characters who will appear in Episode Nine. I personally had no idea that both Dominic Monaghan (Merry from "Lord of the Rings") and Richard E. Grant (recently nominated for supporting actor for the film "Can You Ever Forgive Me?") were in this! 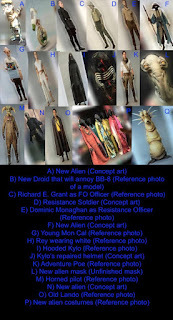 It looks like Monaghan is Team Resistance while Grant is Team First Order. We sure are getting lots of new characters for this last movie. We also get a good look at Lando! Sporting a costume similar to the one he wore in "Solo: A Star Wars Story." What does all of this information mean? Well with no trailer and no title, it really doesn't mean much. Like I said, it looks like this last movie is going to have lots of new ideas and new characters thrown in. Which means its going to be cool and ambitious or it will reek of desperation. Its kind of too early to tell. I liked "The Force Awakens," I was no fan of "The Last Jedi." I have enjoyed the anthology movies so far. I have a soft spot for this universe and this story in general. I don't want to hate this. I hope Episode Nine sticks the landing. I want to love this. I hope it ends well. I hope we get a title and trailer soon, I am very surprised we haven't got anything yet.